The Laúca dam has a production capacity of 2,070 megawatts... enough to supply a city of 8 million inhabitants. In this series of Focus, we look at Angola. You will find out about the challenges facing a country seeking to diversify its economy: Angola wants to shake off its dependence on petrol, which for a long time has been key to its success. And that means developing its infrastructure. 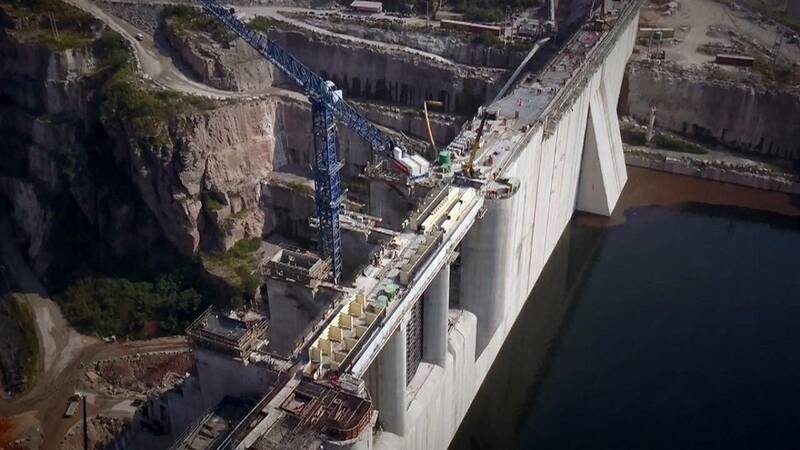 In Laúca, on the river Kwanza, workers are busy building the biggest dam currently under construction in Africa. It will begin operating shortly, an event that has been eagerly anticipated. At a cost of 5.4 billion dollars, this giant looms 156 metres tall and is more than 1.2 kilometres wide. The dam will have a direct impact on the Angolan economy. If access to electricity is key to Angola’s development, its remarkable bio-diversity is also one of its greatest treasures. This consideration has played a major role in the design of the project. For for years, 8,000 people have worked on site, constructing the dam. They come from the 18 provinces of Angola, and many of them were trained there in the role of managers, carpenters or bricklayers. The idea is that they will be able to use this experience to go and work on the next project: another dam, even bigger than this one, located about 30 kilometres away. Back in Angola’s capital, Luanda, there is another symbol of the wave of big infrastructure projects in Angola: its new airport. Here, again, the construction site is impressive: the airport is surrounded by a huge zone of economic activity: a veritable new town, with hotels and a conference centre. This project is quite simply one of the biggest ever carried out in Angola. In total 3.8 billion dollars have been invested in the new airport. The first aeroplanes will take off and land here at the end of 2018, leaving time to complete building work, of course, but also time for extensive testing, something which is essential for the launch of an airport this size. The airport will be able to accommodate some of the biggest aeroplanes in the world, such as the A380, and will be equipped with the latest satellite air traffic control technology. Its objectives: to attract new international airlines, to reinforce the strategy for developing an African hub, and to increase five-fold Luanda’s airport capacity. The environment has also been given full consideration in this project. For example, the aeroplanes landing there will no longer first have to fly in never-ending circles above the city to get into position, as is the case with the existing airport. As for the economic outcome: the project anticipates that the new zone will generate 16 million dollars in turnover per year, as well as, of course, creating jobs in the region. In the last few years, new road and rail links, but also entire cities, have sprung from the ground in Angola. There is no doubt that infrastructure growth is key to the country’s economic transformation.